Sometime around 1975 I was riding with my grandparents through the small town of Dallas, Oregon. My grandmother all of a sudden perks up and says, “Ooh, look at that!” She pointed to a mobile tractor-trailer rig in a mall parking lot displaying broadly upon its side “See The Bullet-Riddled Death Car of Bonnie & Clyde”, or some such variant of that teaser. My minister grandfather stared straight ahead and, per usual, delivered to my hopeful grandmother and myself a clear no in the form of a handy pocket-sermon, “Other person’s misfortunes are not the source or subject of our entertainment.” Not gonna happen. Though disappointed at the time, over the years my grandfather’s sentiment has stuck with me and has gnawed upon my conscience. I have come to believe that he was, at least in some sense, on to something. In 2003 I tried to distill that event (Parker’s, Barrow’s and my relationship – both personal and historical – to their final day) into an object so that I could hold it, inspect it and get a better look at what Rev. Wilbert “Bill” Regier was trying to say. 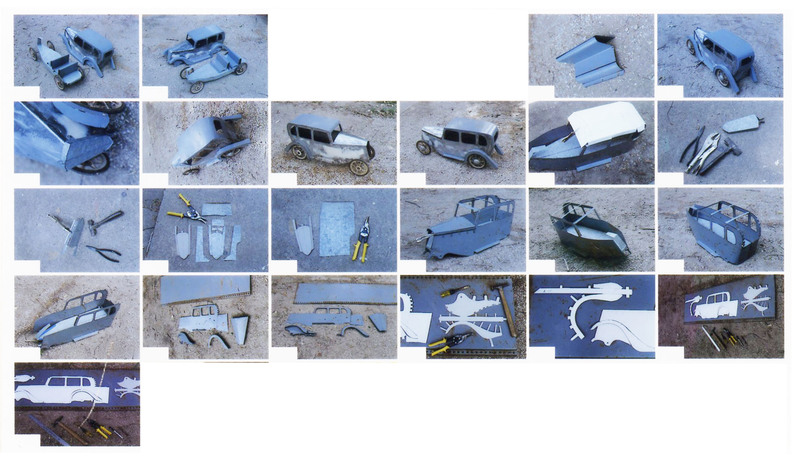 I began by building from sheet-metal a toy-quality facsimile of the brand-new 1934 Ford V8 Sedan that the couple stole from a driveway in Topeka, Kansas not long before their deaths. Not being a gun owner, my good friend and then museum art curator Bill North put me in touch with Jon Blumb, a professional photographer/gun aficionado from Lawrence, Kansas. Jon just happens to also have befriended William S. Burroughs during the author’s years in Lawrence, and the two would often go shooting together. For the sake of veracity, Jon secured a shooting location (film and firearm) on a single-lane dirt road next to a cornfield in nearby Baldwin. The day we convened to reenact my “1/8 scale” historical event Jon beamed as he pulled from his truck a vintage coffee can filled with loose 22 caliber bullets, a gift to Jon from William S. Burroughs himself before his passing in 1997. The scaled-down reenactment shooting was, in my original thinking, to be nothing much more than another formal step towards the completion of the sculpture. The first bullet was fired to test our staging, and then I added to the front seat two rubber gloves filled with red acrylic paint, faux-blood surrogates for our notorious couple. But when the second shot was fired, by Jon if I recall correctly, the car absolutely erupted in a red, globular mist – it was actually kind of horrifying. As the gooey crimson oozed from the car onto the dirt and ran down the doors and off the hood, I just felt…I don’t know…like I had casually picked up a photograph of a house on fire and it had burned my hand; complicit somehow in the original act. I know that Burroughs shot a lot of things, paintings, cans – Joan Vollmer – and I’ve read a fair amount of his works and his biography by Ted Morgan, in an effort to do some justice to the fact that it was his ammo that blew the hell out of my Bonnie & Clyde piece and made it real. I’ve even been in his house on Learnard Avenue in Lawrence and wandered the rooms, basement and yard wondering if I’d feel a vibration, a connection. But in the final analysis (pending another) the resonance I feel is less towards the Bill of Missouri (St. Louis, 1914) and more towards the Bill from Kansas (Whitewater, 1912). I think William S. Burroughs was, among many things, a genius. But I think Bill Regier might of been right.